Crush injuries occur when a part of the body, such as a hand, arm, leg, foot or trunk is squashed. Often there is little visible damage on the outside. But this belies the fact that the damage that has occurred on the inside. This can make dealing with crushing injuries can be problematical. Crush injuries are common on farms and in forestry, where hands are particularly at risk. The most serious agricultural and forestry cases occur when heavy machinery is used. With casualties becoming trapped under them or in-between moving parts. Forestry workers are also at risk from heavy timber in movement, or collapsing timber stacks. Crush injuries are also common following natural disasters, when buildings collapse, and in road accidents. For crush injury syndrome to occur, it must affect a large area, such as the entire arm or thigh. Blood circulation to the area has to have been obstructed. Moreover, the force or pressure applied must be present for some time before Crush Injury Syndrome can occur. 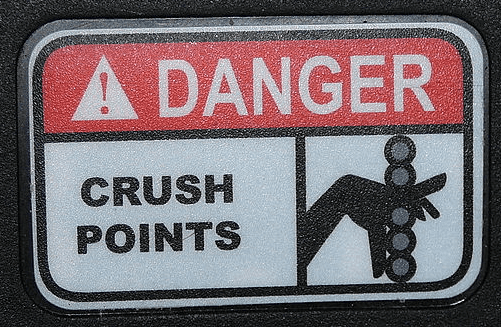 In a crushing incident where the crushing pressure is not released immediately, the severed body part may progress into crush injury syndrome. This may occur if the casualty themselves, or just their affected body part is trapped. Not all crush injuries actually progress into Crush Injury Syndrome however. For example, a crushed finger is very painful, but not a large enough part of the body to cause Crush Injury Syndrome. Crush Injury Syndrome is a potentially life-threatening condition. In this condition, toxins produced by the breakdown of cells in the body are trapped by the compressive pressure. Removing the pressure can cause the sudden release of toxins into the circulatory system. This can potentially overwhelm the kidneys. In addition, releasing the compressing pressure or force can cause fluid to leak into the injured area, resulting in Hypovolaemic Shock. Seigo Minami, a Japanese physician, first reported Crush Injury Syndrome in 1923. He studied the pathology of three soldiers who died in World War I from insufficiency of the kidney. The syndrome was later described by Eric Bywaters in patients during the 1941 London Blitz. The mechanism is believed to be the release into the bloodstream of muscle breakdown products—notably myoglobin, potassium and phosphorus. The most devastating systemic effects can occur when the crushing pressure is suddenly released, without proper preparation of the patient. Release the compressive force, or object, as quickly as you can. DO NOT release the compressive force or object. Crushing injury treatment needs quick action. 15 minutes can pass in the blink of an eye when a situation is stressful. If the compressive object can be moved, do it quickly. If help is not immediately available. Consider removal of the crushing object, but apply a tourniquet above the injury site prior to lifting the object. This will help to prevent the sudden release of toxins into the circulatory system. Dial 999 or alert emergencies services as soon as possible. We have a series of First Aid blogs relating to the forestry and agricultural environment that might interest you. As the preferred first aid provider for Forest Enterprise Scotland, we regularly deliver Emergency First Aid at Work Courses +F courses. That include content on treating crushing injuries and are suitable for forestry and agricultural environments.